Sir Patrick Stewart is narrating "Journey to Space," a new giant-screen documentary on the future of human space travel. A giant-screen documentary on NASA's path to Mars, "Journey to Space," has landed on the small screen — with new 4K ultra-HD, Blu-ray and 3D Blu-ray versions out now. 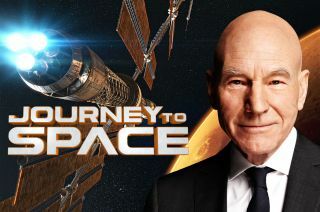 The movie is narrated by Patrick Stewart with extensive commentary by Chris Ferguson, who commanded the final space shuttle mission, and astronaut Serena Auñón, who has not yet flown in space. It first appeared in IMAX theaters, as well as on giant screens in NASA visitor centers and science museums, last March. A new video clip from the film shows the history of the space station's construction and footage of the astronauts that live and work in it, as well as the projects they're working on while up there. The film offers a detailed video history of the space shuttle program, especially its later flights, and then forges forward to describe the research and engineering going into preparing for a mission to Mars. The rumbling blasts of shuttle launches and views of astronauts inside the International Space Station might not be as big as their IMAX incarnation, but the views are still vivid and (depending on your sound system) just as immersive. Looking forward, the film also walks through the eventual mission to Mars and the new inflatable habitat, the Space Launch System rocket, the Orion spacecraft and more in development to facilitate the 2.5-year mission. That segment combines computer-generated scenarios and views of prospective astronauts and engineers hard at work developing and testing out the necessary technological leaps. "Journey to Space" is sponsored by Boeing and Toyota and produced by K2 Films Inc. and Giant Screen Films.